We’re a lucky bunch of rallyists. We’ve got another rest day. This time in the buzzing, busy and beautiful city of Santiago, the Chilean Capital. The sun’s shining, the pool is cool and the shops are open. Some things don’t change though and first stop of the day was the garage where the sweeps and some of the crews were assessing what needed doing to what. 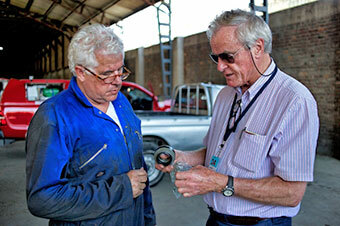 Udo Bichler was having a manifold gasket looked at - and topping up the coolant. Naturally. We found Danny Day under his car sorting out some slight play in a wheel bearing and checking on a weeping sump. It’s a new engine though so he’s not overly bothered by this and he's convinced that a few turns with a well aimed spanner will have cured it. David Williams however had more serious problems. After the wheel loss incident of yesterday the car was trucked last night to a garage and today work began in earnest to repair it. There was plenty of help on hand as well. Andy Actman gave up a days guitar practice and Alastair Caldwell, a noted multi tasker, spent the day both waiting for a new head gasket and helping to fix the Fangio along with Paul Merryweather who also has a lot of experience with this model. A car such as this always draws a crowd and even when up on axle stands and two wheels a party of excited schoolboys took the chance to snap away as the aforementioned drivers fathomed a way to get an old bearing out and a new one back in. After much rumination and head scratching a welder was summoned to fix a collar to the recalcitrant bearing with which it could be pulled out. After that it was relatively plain sailing to put the car back together and get it back on the road. The highlight of our day though was a visit to the 'Collection Jedimar'. 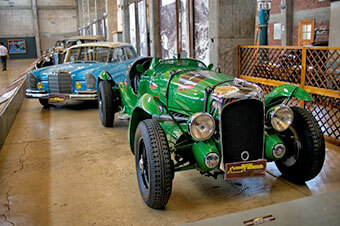 A privately run museum in the middle of Santiago containing the best and largest collection of classic, vintage, pioneer and modern cars in the Southern Hemisphere. Where else, other than on an Endurance Rally Association starting grid would you see such an eclectic mix of cars? Some of the best, the oldest and the most famous examples from Porsche, Packard, Lagonda, MG, Renault, BMW, Fiat and Ford sat side by side underneath a pair of diving airplanes. There was also a collection motorcycles, commercial vehicles and powerboats. Founded by Jesus Diez Martinez (JeDiMar), the collection represents, according to the literature, the realisation of his vision. The founder of Turbus - a coach company - he began the collection in 1967 his first acquisition being a 1927 Ford Model T. In the same year he established, along with some friends the CAAC whose party we will be attending this evening. In 1980 he organised the first vintage rally of Rancagua which ended with a huge exhibition of cars in the town square. Sadly he died in 2007 but the current curator, Luis Jimenez, was happy to show us around and even turned off the infra red security beams so we could get a closer look although he drew the line at letting us sit in them! So, with plenty of energy after a full day of rest thoughts turned to the evenings entertainment. 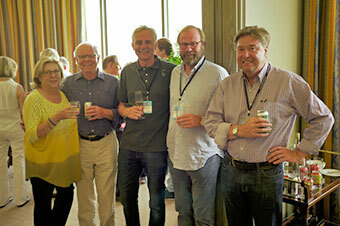 The Yakima crew, comprising Danny Day (who actually fell asleep under his car today), Bill Shields, Bill Dolsen, Leslie Roy et al …… had laid on an impromptu drinks party up on the 19th floor in their Presidential Suite. Justin Bieber, a young Canadian chanteur, had occupied the very same room only a fortnight earlier. He'd strutted his stuff in front of thousands of young Chilean Beliebers and how we all wished we'd been there as well. The views over the city, as the sun began to set made this bitter pill a little easier to swallow - not to mention the cold beer and Cuba Libre and once we’d downed a few we thanked them for their hospitality and made our way across town to the Marriot Hotel where the aforementioned Club de Automóviles Antiguos de Chile had laid on a small reception for us. They’ve been helping source parts for us over the course of the day and it was great to meet them in person. News from the sick bay - John Raker, from the Ford Model A has had a recurrence of an old injury and tonight we see him looking very chipper but with his arm in a sling. Medical ethics prevent us from saying any more.